Please be aware we have a limited amount of low/benched seating available within Armsby Abbey. If you require seating that is handicap accessible, high backed, or appropriate for children under the age of 5yrs, reservations are recommended. We do not offer booster seats or high chairs as they are not conducive to high-top tables. Armsby Abbey is conveniently located right off Route 290 in Worcester within walking distance of all the downtown Hotels, DCU Center, Palladium, and Mechanics Hall. Metered street parking is available during the day. 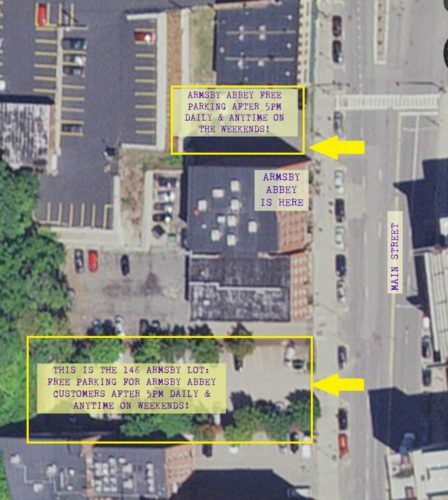 After 5:00pm, and anytime on the weekend, our guests can park in the “Armsby 146” lot to the left of our building. Please be aware that any cars parking here before 5:00pm without a permit during the week will be towed. Parking in any other lot, including the small lot to the right of our main entrance, puts you at risk of being towed as they are private lots and tow 24/7. For reference here is a map. We accept table reservations for parties of 2 or more guests in advance. Please know, we do not offer “call ahead” seating nor are we able to accept online reservations once the day/evening’s service has begun; you would need to call 508-795-1012 to check availability. If you are planning a special occasion, say perhaps an engagement? Do let us know in advance so we can help you perfect this momentous occasion. For larger parties of 15+, our seating is limited. Please give us a call so we can best accommodate your needs in advance; we will always do our best to assist you in any way possible!